Now Android Wear Ready! 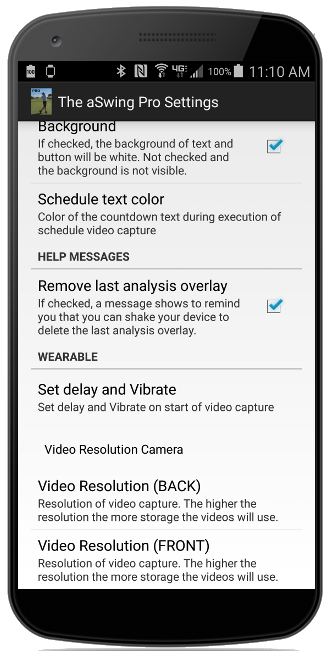 -- Use Android Wear to remote control when to start video capture. The aSwing Pro is a video capture analysis tool. It allows the user to view their video frame by frame and draw analysis overlays in each frame. There is no need for any login or registration to use: just download the Free or Pro version of this app. Install, create your album(s), record video(s), and then analyze them frame by frame. 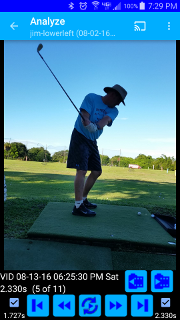 This is a great golf swing analyzer app; however, it is great for any sport or activity, including lacrosse, baseball, basketball, etc, to review the swing or a general movement in slow motion. Google Wear Ready Yes Yes Tested on physical LG G device. Tested on round emulator. Compare multiple videos No Yes Compare up to 4 videos at once. See FAQ menu item for more information. Capture Video Schedule No Yes Capture up to 10 consecutive videos with a configurable delay (in seconds) between each capture. The following is the list of hardware that this application has been tested. If your device is not listed, please download the Free version of this application prior to the Pro version. 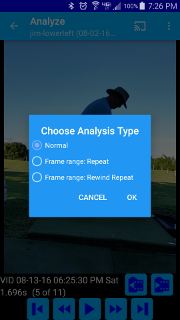 Available for Pro, accessed from the Analyze screen, select the action menu and select "Choose Analysis Type" option. Select either "Frame Repeat" or "Frame Rewind/Repeat" (Image #1). The buttons at the bottom change and include two check boxes. Press the next frame button a couple of times. Press the left checkbox and the frame time will appear underneath it (Image #2). Press the next button a couple more times. Press the right checkbox and the frame time will appear underneath it (Image #3). Now press the play button that has two arced arrows. Depending the analysis type, it will either repeat from start to finish and then back to start frame. Or it will show the frames in reverse order. If a new start frame is desired, press the previous button to the desired frame, press the checkbox to unselect and press checkbox to place a checkmark back in the box. This is the new start frame. 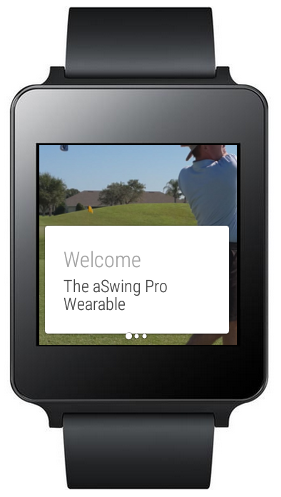 How is Android Wear integrated into The aSwing Pro? Android Wear will work for both the Free and Pro version of the app. It allows the user to remote control starting/stopping a video capture. 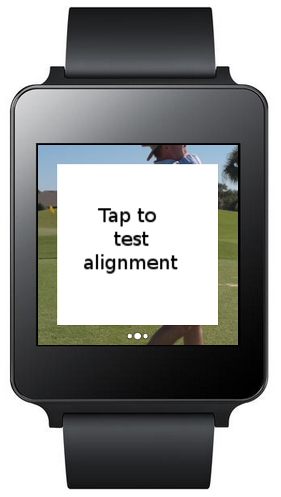 There is a feature to test the users alignment before even starting a video capture. Simply start The aSwing Pro as usual and go to the Capture option on the handheld. The aSwing Pro wearable app will already have been installed on the watch. 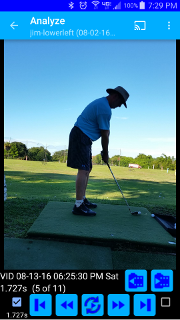 If your handheld device has no activity from The aSwing Pro wearable for 10 minutes, your handheld device's screen may turn off and you won't be able to remote control when to capture video. Available for Pro and Free, accessed from the Analyze screen, the Action bar menu contains the "Transparent Frame". Click that and a checkbox and seekbar appears. 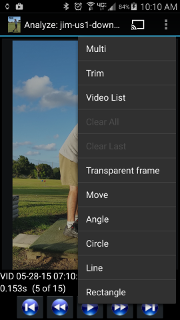 Use the seekbar to find the frame that should be overlayed. Use the checkbox to show/hide that transparent frame. Drawing angles as an analysis overlay is a new feature. How does it work? Very similar to drawing a line overlay. Keep finger on device and stop moving your finger for about 1 second. The device will signal a vibrate. Start moving your finger again. The 2nd line is drawn along with the angle between those lines. Remove finger when you're done. From the main menu, choose the Review Videos. On that new screen, in the popup menu from lower right there is a button called Videos. Choose that button. In the dialog, there is a button at the top that will be enabled labeled "Delete selected video". Before version 1.4.1 this button was labeled Delete. Where do I go to compare up to 4 videos simultaneously? From the main menu, choose the Review Videos. On that new screen, in the popup menu from lower right there is a button called Multi. Choose that button. When I compare up to 4 videos, how can I keep the frames in sync? After choosing your videos, you use the buttons at the bottom as usual. Each video is on a button. For only that video, if you press the right side of the button it will forward to the next frame. If you press the left side of that button it will go to the previous frame. When I choose the App Settings, it seems to take several seconds. Why is that? It is initializing the camera(s) and needs to get their captures resolutions. If you upgrade from the Free version to the Pro version, do I have to re-run the App Settings? Yes. Those are two different applications and they each store their App Settings in their own (non-shared) location. If you upgrade from the Free version to the Pro version, do I lose the video from the Free version? Once I upgrade from Free to Pro version, can I uninstall the Free version without losing the video created with the Free version? The Pro and Free version require internet access. What is this for if it is claimed there is no abnormal application permissions? On the front page, there is a button at the top with the icon and name of the application. Clicking that opens the device's browser and goes to this website. 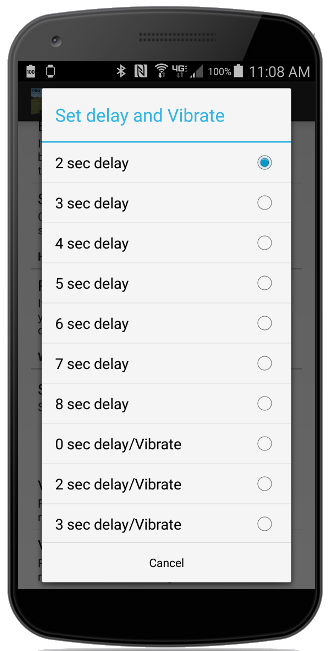 These capture options can be configured in the The aSwing Pro's Settings (on the handheld device) such that when the Wearable app is started from the handheld device, the delay option is automatically set. The wearable also allows the user to align themselves with the handheld's camera. This allows the user to ensure they will be in the correct position while video capturing is occuring. Long press on the wearable to exit the The aSwing Pro Wearable. NOTE: the first time The aSwing Pro is installed it will take about 1 minute for the The aSwing Pro Wearable to be installed on wearable device. 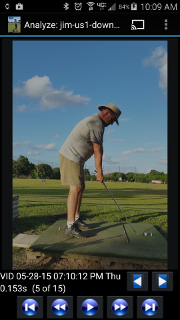 The following are screen captures of The aSwing Pro Wearable device app and The aSwing Pro handheld device app. Please use the contact information on the Google play store for the apps (under the Developer section, lower left). Google Play Store is accessible from the buttons on the left of this website.